On Monday, Amazon officially assumed ownership of 460 Whole Foods stores—and immediately went to work on customers' perceptions of the retailer’s prices. Now, just one day into the Amazon era at Whole Foods, it appears the online powerhouse is already giving shoppers what they want: lower prices. But how deep and widespread are the price cuts? 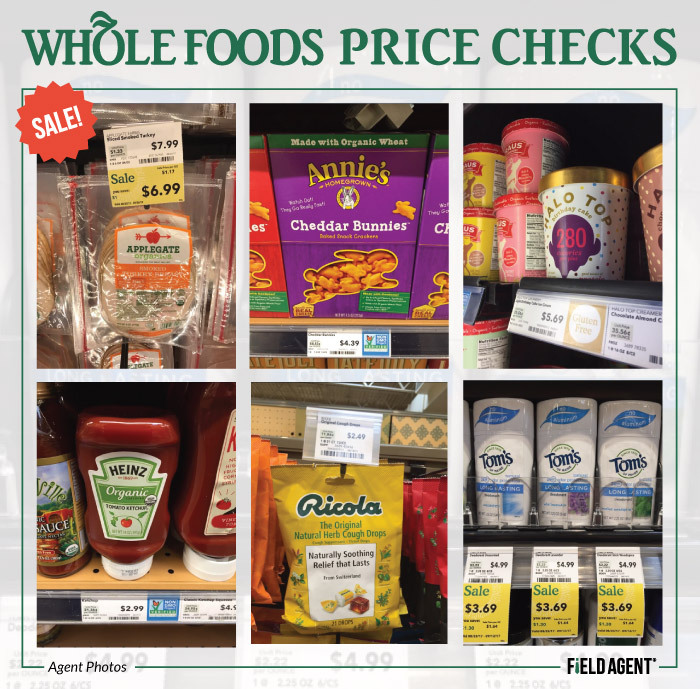 Since June, retail-auditing firm Field Agent has been collecting pricing information on a randomly-selected basket of 12 goods—including Ricola cough drops, Tom’s of Maine deodorant, Annie’s Homegrown Cheddar Bunnies, and 365 Everyday Value 2% Milk—inside 20 Whole Foods stores across 20 different states. *Each product in the index averages together pricing data from between 10 and 12 stores. The index combines data collected from Whole Foods Markets in the following locations: Little Rock, AR, Lafayette, CA, Fort Collins, CO, Baton Rouge, LA, Brighton, MA, Portland, ME, Troy, MI, New York, NY, Woodmere, OH, Mount Pleasant, SC, Dallas, TX, Seattle, WA. As displayed in the index, prices for our basket of goods dropped 5% between August 4, 2017 and today. The going rate for seven of the products in our 12-good basket did indeed fall over the course of the month, with Tom's of Maine deodorant showing the greatest decline (-26%). Three other products remained stable from the beginning of the month to now, while two items—Ricola Cough Drops and Mrs. Meyer’s Dish Soap—went up in price, 7% and 24% , respectively. 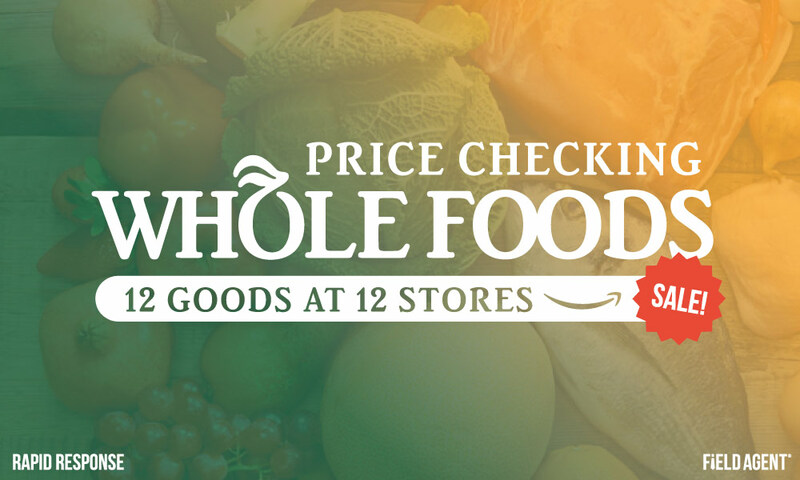 So, yes, results suggest Whole Foods' prices have lowered since Amazon took over, though our study may suggest the company is initially focused with slashing prices only on a specific selection of goods. Explore the Rise of Online Grocery Shopping. Download Groceries 2.0 Revisited! Carol Spieckerman, President and CEO of Spieckerman Retail, views the price-cutting campaign as primarily a way to change customers' perceptions. “Whole Foods isn’t wasting any time cranking up the buzz machine and that’s a smart strategy," Spieckerman said. "By many accounts, the price changes aren’t particularly widespread at this point but any changes will have the effect of shifting perception as the media is essentially providing free advertising by covering the reductions." 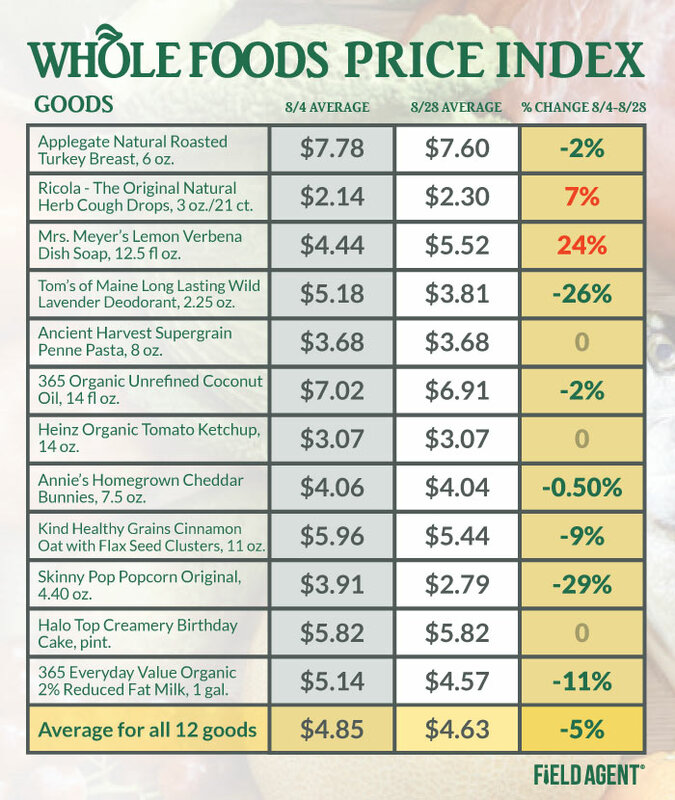 Thus, patience will be key as companies and media outlets try to interpret price changes at Whole Foods. Only time can reveal true structural price change on a product-by-product basis. 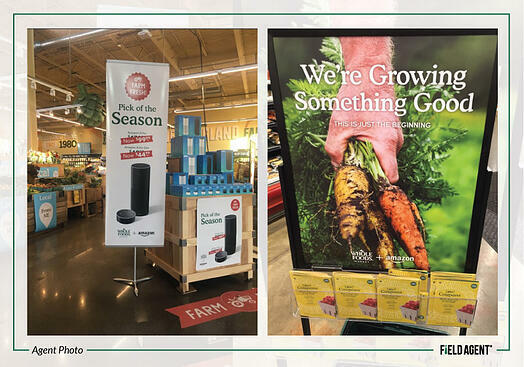 While conducting price checks inside Whole Foods Markets, Field Agents also captured these photos of Amazon-branded signage. Not all stores, agents reported, are presently featuring such signs. Explore the rise of online grocery shopping in this completely updated and widely expanded second edition to our popular original report. Authoritative and entertaining, Groceries 2.0 Revisited encompasses 11 mobile studies, 5,890 survey responses, and 116 mobile mystery shop responses.